According to the World Health Organization’s 2015 Global Road Safety Situation Report, not all road users around the world enjoy the same level of road protection. The risk of dying from a traffic accident still largely depends on where people live and how they move. In fact, more than 90% of road-related deaths and injuries occur in low- and middle-income countries, and Africa is one of the most affected regions. With only 2.3% of the world’s vehicles, the lowest level of motorization globally, Africa has the highest road traffic fatality rates in the world: 26.6 per 100,000 population. 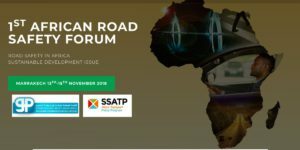 In this contest, the Ministry of Equipment, Transport, Logistics and Water of the Kingdom of Morocco and the Africa Transport Policy Program (SSATP) co-hosted the 1st Forum on Road Safety in Africa, held last 13–15 November 2018 in Marrakech, Morocco – the first of its kind in Africa. This year’s theme was “Road Safety in Africa: Sustainable Development Issue”. As output, African Ministers committed to funding several actions in all aspect for Road safety, to be implemented during the calendar year 2019. In between these actions CITA welcome the decision to promote the adoption of regulations for importation of cleaner, safer and more efficient vehicles, including used vehicles. Ministers encouraged also countries to prioritize the development of their civil registration and vital statistics system with the involvement of all stakeholders and international partners. Regarding the African Road Safety Observatory (ARSO), African countries concluded on the proposed governance arrangement and the initial work plan of the observatory. Partners and Donors were requested to support this initiative, and all African countries were invited to join ARSO, under the established bylaws.